How big does the conspiracy go? Uncover the truth behind the CIA, LSD, mind control… and the death of a family man. Directed by boundary-breaking filmmaker Errol Morris, Wormwood explores the limits of knowledge about the past and the lengths we’ll go in our search for the truth through the story of one man’s sixty-year quest to identify the circumstances of his father’s mysterious death. 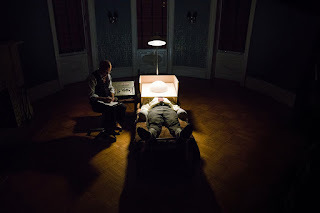 Combining a virtuosic performance by Peter Sarsgaard with Morris’ legendary interview style, Wormwood examines the true story of Eric Olson’s journey to uncover the truth about his father’s death from every possible angle, bringing the viewer face-to-face with some of the United States’ darkest secrets. This is not your run of the mill police drama though, nor is it a talking heads documentary. As Morris said himself in a recent interview with Variety magazine (here) "I told them I wanted to do something that combines straight drama, reenactments, archival research, various diverse graphics elements, and on and on and on. It wasn’t going to be documentary business as usual. It was going to be something different."